Write the email you wish to create a template from. Format it how you want, give the email a subject and if required include any standard attachments that you need. Click the Save as email template button and Enter a name for the template. 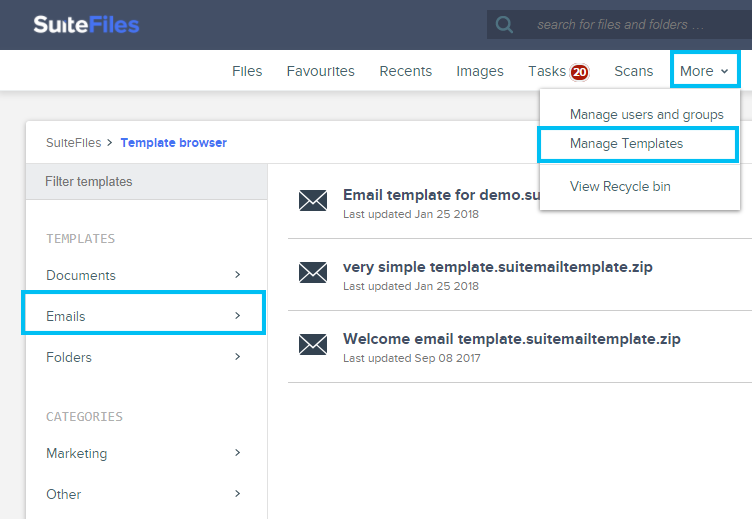 If your SuiteFiles site is connected to the Xero Practice Manager (WorkflowMax) you will be prompted to choose a client name and populate the email template with data about that client. If not required click Don’t Prepopulate. The new email is created and can be tailored before sending. Unfortunately you can't edit these email templates from here. These templates are a special file that we have created purely for SuiteFiles and doesn't have an editor. You can rename and delete the email templates from here by clicking the ... to the right of the template name. If you need to edit an email template then you should follow this process. You can, if required, then rename the new email template to have the same name as the one just deleted.